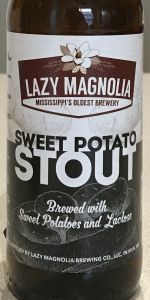 Jefferson Stout, Lazy Magnolia's original Sweet Potato Cream Stout, is Lazy Magnolia's version of the ideal Southern-Style Stout. Jefferson Stout is brewed with sweet potatoes and lactose (milk sugar). The sweet potatoes provide the background to an impressive taste with added notes of roasted chocolate, coffee and caramel flavors. 3.06/5: Utterly forgettable...what were we talking about again? Had this beer on tap at Mugshots on Saturday Night. I've almost made my way through their entire portfolio. A: beer came in a 22oz mug with a half inch of a fluffy tan head. beer was black as night just like a stout should. S: smelled like roasted malts with a little bit of sweetness. Nothing out of the ordinary and not very robust aromas. T: slightly bland and watery but inoffensive roast malt flavor with a kiss of chocolate and coffee. Very sweet and lingering aftertaste. This beer vaguely reminds me of Left Hand Milk Stout with the taste but Jefferson Stout has a much sweeter aftertaste. This caused it to loose points because it wasn't something I found desirable. M: Thin and watery for a stout with typical minimal carbonation that was only apparent from the prickly feeling it left on the swallow. D: Heavy on the stomach like a typical stout so one was enough to satisfy me. Overall: Not bad, but not something I'm going to go hunting for on tap since they don't bottle the entire line. It almost made sitting at the bar listening to the obnoxious Bama fans tolerable. I don't know if it's because I'm used to drinking big beers, the southern style they have or if its the terrible beer laws they are forced to abide by here but most every beer has been fairly lackluster and disappointing.